Banana: The Fate of the Fruit that Changed the World: What does Keira Knightley have to do with our endangered banana? What does Keira Knightley have to do with our endangered banana? "Duchess chronicles the life of 18th century aristocrat Georgiana, duchess of Devonshire, an ancestor of Princess Diana who was alternately celebrated and reviled for her extravagant political and personal lives. Accompanying Knightley in the cast are Ralph Fiennes as William Cavendish, the fifth Duke of Devonshire, and Dominic Cooper as Charles Grey, the second Earl Grey." In my book, I explain that our banana - the endangered one - is called the Cavendish. It is named after the Duchess's son, the third William Cavendish, and the sixth duke. This Cavendish - who never married, and was known as "the bachelor duke" - spent his time building up the family estate's gardens and greenhouses. Around 1830, he received a sample banana plant that had been brought to England from the South Pacific. The Cavendish banana's stock eventually was brought to the Caribbean, where it became the "mother plant" for most of the fruit we eat today. I don't know if the sixth duke's mom looked much like Keira Knightley, but, as the accompanying illustrations show, big hair isn't unheard of in the banana world. 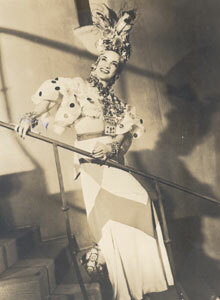 Above is Keira; underneath is Carmen Miranda, the Brazilian actress who was the inspiration for the Chiquita banana character. The movie comes out in 2008. If you want to see bananas more directly in film, find a copy of Busby Berkeley's "The Gang's All Here," which features Miranda in a seductive dance with man-sized bananas. Visit the Cavendish family's Chatsworth estate and gardens (now part of a British national park, though the family still maintains a residence) here.